You know, we’re starting to get the feeling that David Lynch and Mark Frost are just screwing with us now. Even if they are, we’re loving it, even at the Roadhouse. 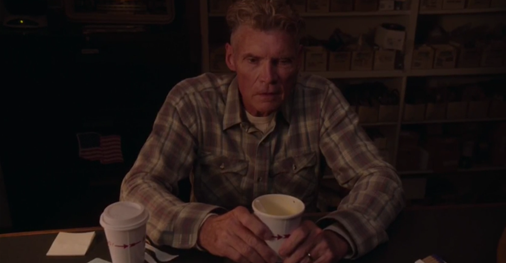 Corinna Bechko joins us in our jaw dropping reactions to the latest from Twin Peaks. Just before the credits roll, when Big Ed is eating his takeout-soup he puts it down on the table, but the reflection in the storefront glass shows him still holding the cup. After a few seconds, the reflection suddenly syncs up to reality again and the cup goes down. Clearly, the dimensional infrastructure is quite visible in this series. Also, the whole series initially was supposed to be in North Dakota. Plot device that people seem to be oblivious to.